Head to Toe Diagnostic Efficiency™…. Clinical signs, a probe, a CT and expert interpretation means getting clinical answers and direction in same day turnaround. SonoPath has entered into functional on-site CT in cooperation with Blairstown Animal Hospital….and Dr Ken Leal.This patient had progressive clinical neuro signs with pathology visible in minutes…. What you can’t find with a probe, the CT will. Many thanks to Dr. Sanam Sean Maniar, DVM and his team from Rockaway Animal Hospital for their exemplary care and management of this difficult case. We would like to also thank Sebastian Schaub, DVM, Dr. med. vet. DipECVDI for his interpretation of this case. The patient was presented for trouble seeing and staring into space. She appeared to respond well to steroids. Recent blood work was essentially normal. A large irregular soft tissue attenuating mass lesion is associated with the right temporal bone. The mass lesion presents stippled to amorphous mineralization. 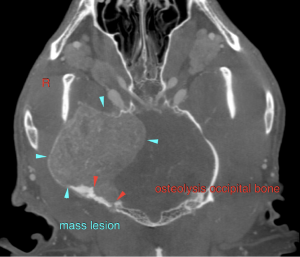 Extensive permeative osteolysis of the right temporal bone – including the zygomatic process and right tympanic bulla – with perforation of the cranial fossa is seen. The mass lesion presents marked extension into the cranial fossa, causing an extraaxial mass effect with distortion of the brain and a midline shift of the cerebral falx to the left. The mass lesion extends into the caudal part of the cranial fossa, the adjacent occipital bone presents permeative osteolysis as well. The medial extension is up to the level of the right orbital fissure and aggressive osteolysis of the right sphenoid bone is seen. 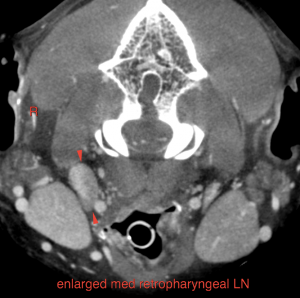 The right medial retropharyngeal lymph node is moderately enlarged with mildly irregular contrast enhancing. 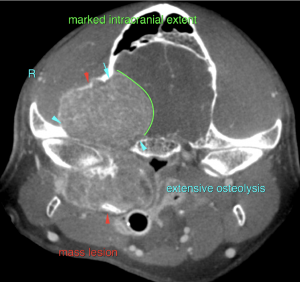 Biologically aggressive mass lesion of the right calvarium with aggressive osteolysis of the right temporal, occipital and sphenoid bone, extensive perforation of the cranial fossa and marked mass effect on the brain. Lymphadenomegaly of the right medial retropharyngeal lymph node. Main differential diagnoses are osteosarcoma, chondrosarcoma,multilobulated tumor of bone (chondrosarcoma rodens) and squamous cell carcinoma. The lymph node changes are suggestive for metastatic spread. Final diagnosis would require sampling of the primary tumor for histology and fine needle aspiration of the lymph node. The lesion is not resectable. The long term prognosis is poor. However, staging and palliative treatment such as tumor irradiation could be considered depending on the owner’s wishes.